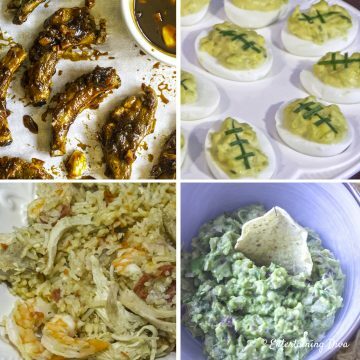 Every year, I host a Super Bowl party that all of my friends (and a lot of their friends) attend. In other words, there’s a lot of people. 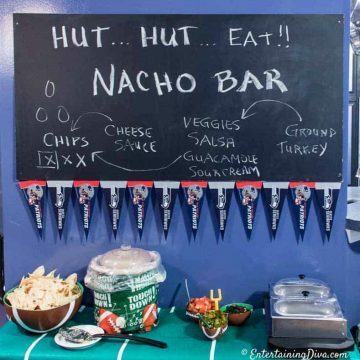 I’m always looking for football decorating ideas and game day party food that will take the party to the next level. 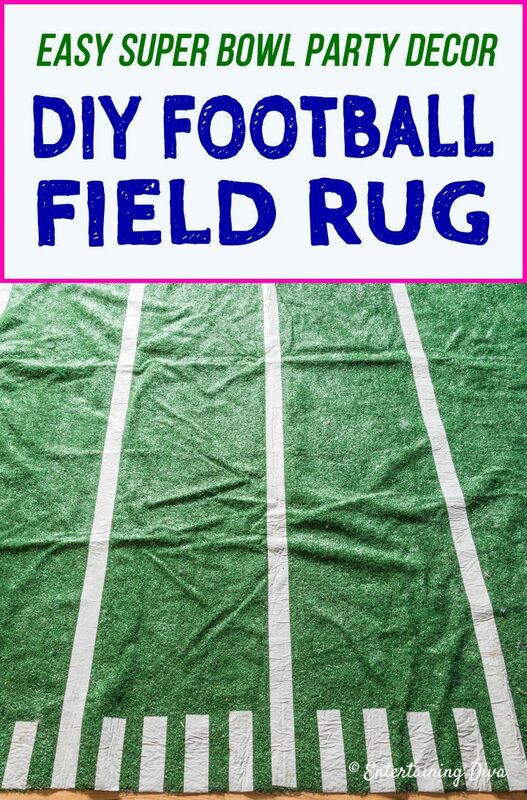 This DIY footbal field area rug is one of the Super Bowl party decorations that always makes an appearance! For some reason, my football always parties seem to have more spills than any other party (probably because of the number of people). So I like to take up my area rugs whenever I’m having people over to watch the game. 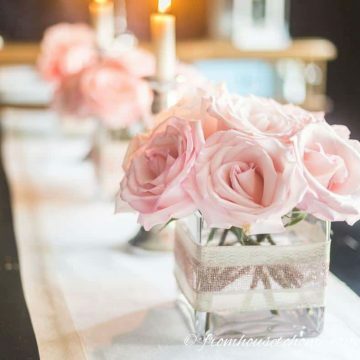 I wanted something that I could put down on the floor which would go with the football party atmosphere, and be spill-resistant. 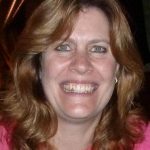 Then it came to me…what would be better than artificial turf? Or even better than that, an actual football field made from artificial turf. 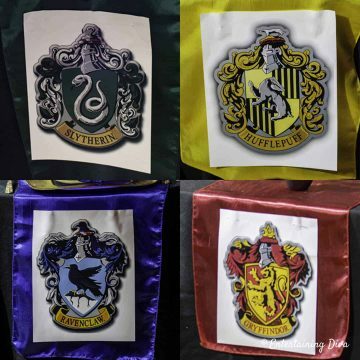 Plus it would be a great addition to my game day party decorations. And that’s how my DIY football field area rug came to be. 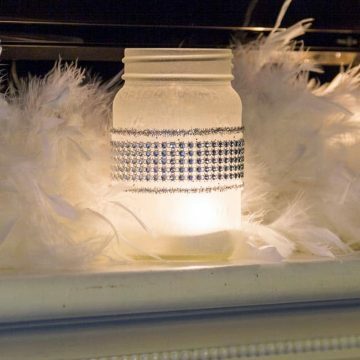 It ended up being a really easy project and it has stood the test of time. 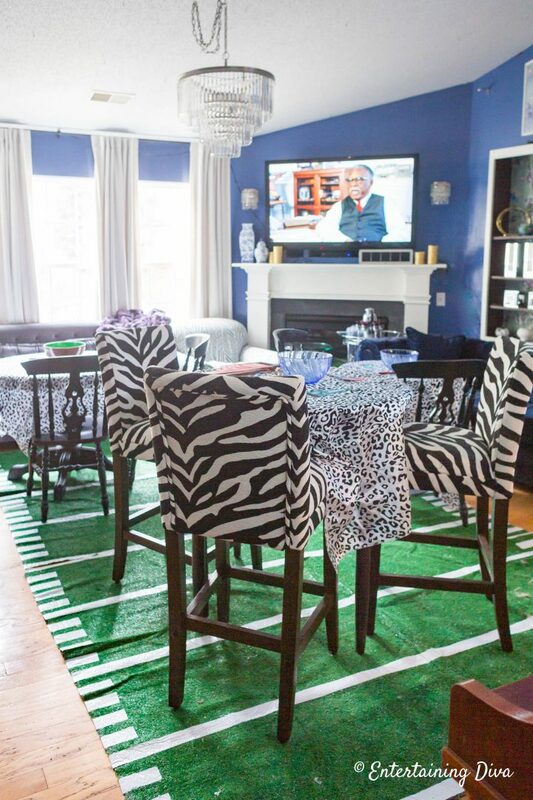 My DIY football field area rug is about to have its 10th anniversary of appearing at my annual Super Bowl party! 2 – 6′ x 8′ pieces of artifical turf* – You can use bigger or smaller pieces of turf if you want. This will make an 8′ x 12′ rug which was big enough for my living room (especially since I didn’t want to spend too much money on this project). 1. Use the duct tape to tape together the 2 pieces of artificial turf across the 8′ end (so you end up with an 8′ x 12′ piece of “grass”). This will form the center line. a. From the center line (which is the tape that you just used to join the 2 pieces of turf together), measure 20″ out and make a mark on both sides of the rug. b. Tape from one side of the rug to the other to join the 2 marks together. Make sure to match the center of the tape to the pencil marks so that the line is fairly straight. c. Do the same thing on the other side of the center line. d. Continue measuring out 20″ and taping the lines across the turf in both directions until you get to the end of the carpet. a. Mark lines every 4″ between each set of two full-width lines, on both sides of the rug. There should be 4 marks between each set of full-width lines. b. 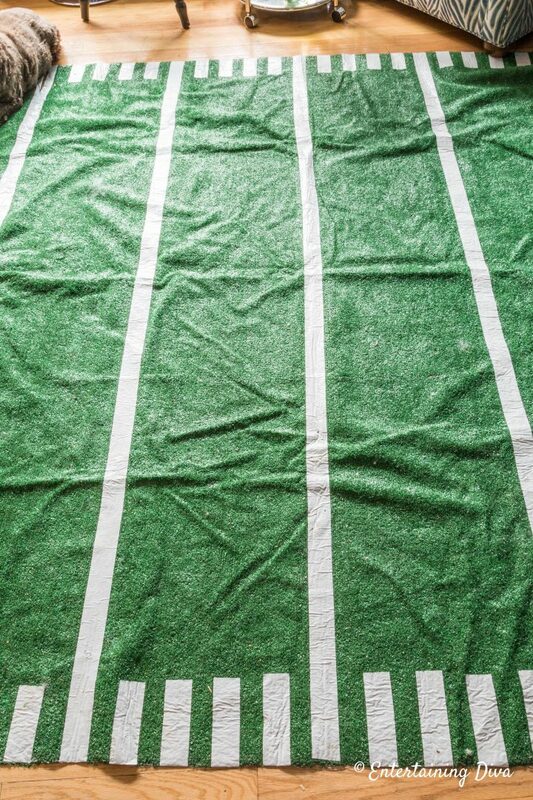 Cut 6″ pieces of tape and tape it onto the turf so that the end of the tape lines up with the side of the rug, and the tape is centered on the marks . 7. If you want a more finished look to the rug, you can tape around the edges of the whole rug. Fold the tape over the edge to prevent the edges from fraying. Or if you want to make sure that no-one trips over the edges of your turf, you can tape it down to the floor all the way around the edges. Which will also give it that finished look (although it may take some extra elbow grease to get the duct tape residue off the floor…that stuff sticks to everything! Well that’s it for my DIY football field area rug. 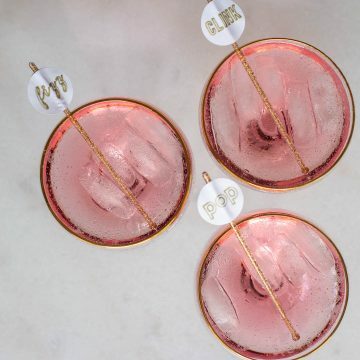 I told you it was easy football party decor! 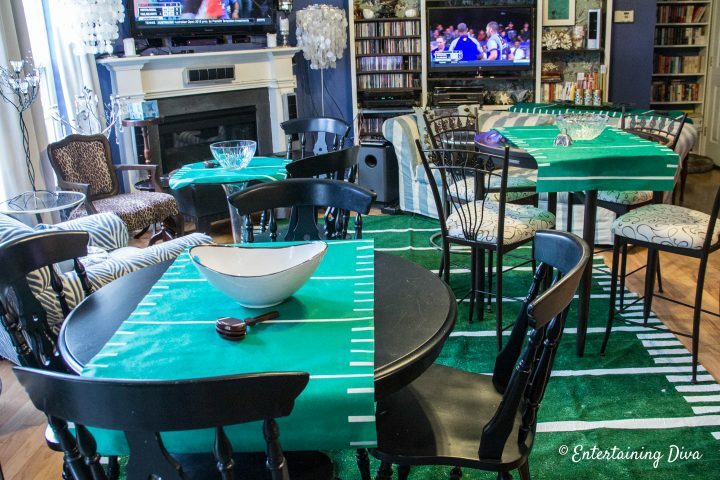 Have questions or comments about our DIY football field area rug (easy football party decor)? Tell us in the comments below.